This stand mixer from KitchenAid is part of the 600™ Series and is the replacement to the KL26M8XOB. Each 600® Series mixer has a powerful motor that can handle 14 cups of flour at once and the 6 quart bowl has enough room to mix up 13 dozen cookies at once. The stainless steel bowl is dishwasher safe and the unique planetary mixing action will touch the bowl 67 times in one rotation, ensuring that this mixer will incorporate all your ingredients evenly. 67-point planetary mixing action ensures that the mixing paddle hits the bowl 67 times with each rotation. This makes for more consistent mixtures and faster whipping times. 6 - Beating and creaming for medium fast beating or whipping to finish mixing cakes and other batters. High speed for cake mixes. Professional 600 series with pouring shield, 6 qt. 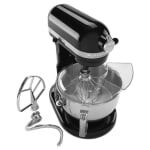 polished stainless steel bowl with comfortable handle, burnished flat beater, burnished PowerKnead spiral dough hook and wire whip, pouring shield, stain nickel hinged hug cover, commercial auto reset, comfort bowl lift handle, 120v/60/1ph, Onyx Black. Warranty not valid when used in commercial environment such as a bar or restaurant.